• Cocker Spaniel dog breeders are listed below alphabetically by State / city. 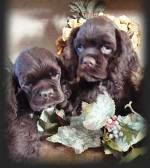 • Click on underlined words to see their Cocker Spaniel puppies for sale. • Please tell the Cocker Spaniel dog breeders with puppies for sale that you found them on BreedersClub.net. The Cocker Spaniel breed is among the most popular pets. This may be attributed to its friendliness to people, other dogs and animals, ease of training, and its being very affectionate. They were bred originally as gun dogs, and of the Spaniel famiily. They do well with daily exercise and do better as inside dogs. Family owned kennel located on 13 beautiful country acres near Greenwood, Delaware. We have been raising exclusively the wonderful breed of puppies for over 25 years. Our pups/dogs are healthy and beautiful AND have a GREAT temperament. All pups will receive their age appropriate shots and wormings before leaving our kennel plus they will be registered with the Continental Kennel Club. There will be a puppy pack (that contains a shot record, health warranty, puppy manual and sample bag of dog food) that will go home with your pup. We DO NOT ship. Here, our main objective is to achieve excellence in the show ring. Our puppies are bred with this in mind: health, temperament and the AKC standard is our goal. We do offer puppies for both show and companion homes. Breeder of fantastic, beautiful dogs for many years. All of our litters are always champion sired and most of the time the mothers are champions. We health test all parent dogs. I have been a breeder of champion-lined AKC puppies for over 30 years. My goal is always to raise beautiful, well-bred, high quality puppies and to improve the breed with the quality of my puppies. My puppies are born and raised in my home and are well-socialized with people and other dogs and spoiled a lot by me, my 4 children and 5 grandchildren. I don't have an outside kennel. My girls are members of my household and are very loved and spoiled. This breed directory page features Cocker Spaniel dog breeders with puppies and/or adult dogs for sale. Once you purchase your new found friend, you will want to provide it the best in pet health care. Be sure to visit our online discount pet supplies catalog and order NuVet Plus™ to keep your puppy and adult dogs in top condition. The discount catalog also features collars, leashes, carriers, general pet care products and much more. BreedersClub.net does not pre-screen the Cocker Spaniel dog breeders who advertise their puppies and dogs for sale in the BreedersClub.net breeder directory and in the classified ads. We require all advertisers to agree to our advertising terms. You should ask the Cocker Spaniel dog breeders you talk with for references from past buyers and veterinarians.